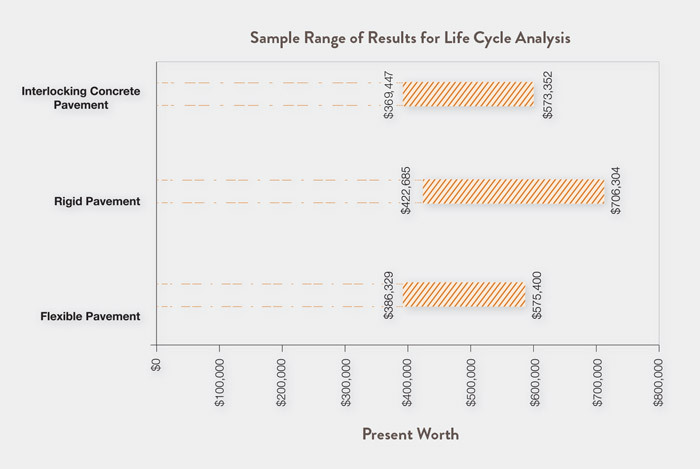 Life cycle costing analysis is a technique that quantifies all of the costs associated with the construction and maintenance of a pavement over a set analysis period. According to the report - Life-Cycle Cost Management of Interlocking Concrete Block Pavements - Methodology Report - from ARA/ICPI, a paver system is expected to last 30 or more years before it reaches the trigger pavement condition index where rehabilitation is required. During this time, the following level of maintenance is expected. 1. 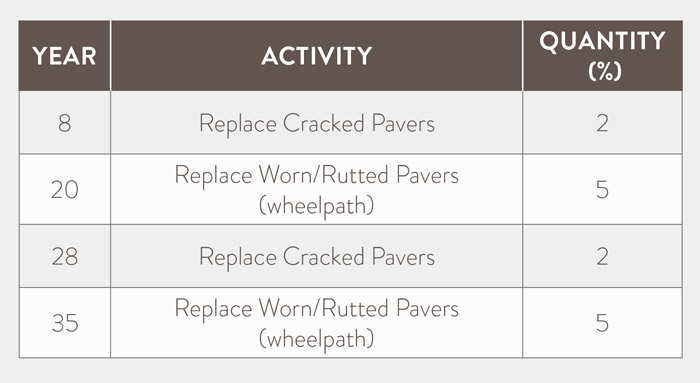 Higher performance life of pavers as compared to asphalt. An investment in roadway infrastructure does not stop after initial construction. Like any asset, it requires some investment to keep it in usable condition. For roadways, this includes ongoing surface maintenance, periodic restoration and eventual base rehabilitation. At years 8 and 28, it is expected that approximately 2% of the pavers over the entire surface will have become cracked or chipped and will need to be replaced. In years 20 and 35, a more significant maintenance is expected to take place - this includes removal of a larger area of pavers (most likely in the wheelpaths), leveling/replacement of the bedding sand underneath, then reinstatement of a majority of the original pavers. Although we cannot guarantee the life cycle costing will be less in every circumstance, we are willing to assist with the analysis to determine if pavers are ultimately more economical.